On July 29, 1981, the entire world watched as Prince Charles and Princess Diana became husband and wife. Never has there been a royal love story like Prince Charles’ and Princess Diana’s. The couple met when Diana was only a teenager and Charles was dating her older sister. Several years later, after only 12 dates, the couple got engaged and were married within six months at St. Paul’s Cathedral. The wedding was broadcast on television and seen by around 750 million people around the world. An international event, it is remembered as one of the most famous weddings in royal history, even after Princess Diana and Prince Charles’ divorce in 1992—only five short years before her untimely death in 1997. When Prince Charles proposed to Lady Diana Spencer, he invited her to choose her own engagement ring, from a selection at Garrard – the royal family’s official jeweler. 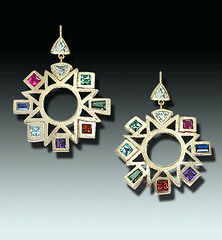 She chose an 18-carat oval sapphire, surrounded by 14 smaller diamonds, which was part of the company’s catalogue. This caused a stir at the time – anyone who had the money in 1981 could have purchased an identical copy of the ring. It wasn’t specially made – it wasn’t even a diamond ring. But the future princess had an eye for style even then, and her iconic choice was copied by brides-to-be the world over for years afterwards. The sapphire was in the spotlight again over 30 years later, when it sparkled on Kate Middleton’s finger as Prince William presented his future bride to the world. Giving Kate the ring was the Prince’s way of ensuring his late mother was included. “Obviously, she’s not going to be around to share in any of the fun and excitement of it all, so this is my way of keeping her close to it all,” he told the assembled press. Before leaving for Kenya where he planned to pop the question, William took the ring from a royal safe, and carried it around with him in his rucksack for three weeks in Africa before he finally asked for Kate’s hand. “I literally would not let it go. Everywhere I went, I was keeping ahold of it because I knew if it disappeared, I’d be in a lot of trouble,” said the future King. Charlene, Princess of Monaco is a Zimbabwean-South African former Olympic swimmer and wife of Prince Albert II. The Princess was born in Bulawayo, Rhodesia (today Zimbabwe), the daughter of Michael and Lynette Wittstock, and the family relocated to South Africa in 1989. Charlene represented South Africa at the 2000 Sydney Olympics, with her team finishing fifth in the 4 × 100 metre medley relay. Charlene retired from competitive swimming in 2007. Charlene met Prince Albert at the Mare Nostrum swimming competition in Monte Carlo, Monaco, in 2000. They were first seen together in 2006, and Princess Charlene has accompanied Prince Albert on many of his official duties since then. They announced their engagement in June 2010, and were married on 1 July 2011. The Princess’s pregnancy was announced on 30 May 2014. On 10 December 2014, she gave birth to fraternal twins Princess Gabriella and Hereditary Prince Jacques. Eve has also been inspired by underwater mysteries in her work.. Her “Triton’s Ball” necklace is a joyful gathering of seahorses. 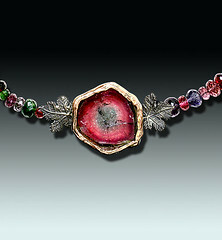 This celebration features rare two and three colored tourmalines and seahorses bound together. 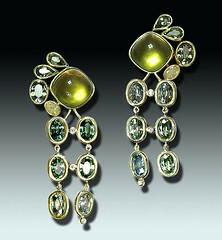 “Seahorses mate for life and these bi-color tourmalines symbolize a union or marriage” states Eve. How will you surprise your princess?